We are proud to launch NSE Cash Market (Equities and Index) realtime charts with lots of technical indicators and Interactiveness. Now one can track the equity markets on the go with greater control over the technical indicators. Last year we launched Interactive – NSE FNO realtime charts (more than 30,000 symbols) and NSE Cash and Futures EOD (Full historical right from the start of NSE). After a massive feedback from the traders we thought of moving one step ahead. 1)Access to 1500+ NSE Cash (Equity and Index charts) in realtime(updates every 5min). 2)More than 50+ Built-In Technical Indicators. 3)Supports custom indicators. Currently Supertrend, KAMA (Kaufman Adaptive Moving Average), Fisher transform indicators has been added. Soon more custom indicators will be added based on request. 4)Authentic data directly from NSE Dotex and charting library from Tradingview. 6)Ability to change the chart properties (Candlestick color, chart background), Scales and Timezone. 8)Supports Gartley and Elliot Wave pattern drawing tools to identify pattern at the ease. 10)Public access to save/load templates and retrive your charting studies later. 11)Draw text, write a note, draw up and down arrows over the chart. 12)Measure the time and price between two candlestick in the charts. 13)Zoom and UnZoom the charts and a smooth scroller. Optimized for Tablet devices as well. 14)Custom timeframes like 5min, 10min, 15min, 20min, 25min, 30min, 75min, 90min, 1 hour, 2 hour, 4 hour charts. 15)Ability to take screenshots and share over charts with studies over twitter. Nifty and Bank Nifty charts for 5th April 2011 Trading Nifty in buy mode with support zone coming around 5800-5810 zone and Bank Nifty turned to buy modewith supports coming near to 11700 on 90 min charts. Mircosoft Vs Apple Look at this chart of Microsoft’s market value from the Gates to Steve Ballmer hand-over. Since 2000 Microsoft is moving in sideways fashion. Its an excellent move from Marketcalls. I would like to appreciate and Thank you very much on behalf of all of Market calls followers. Thank you from the bottom of my heart. 2. Could you please add 1 min ,2 min, 3 min time and daily ,weekly and monthly time frame as well. I am aware that you have a separate link for view EOD, weekly and monthly charts. However having them incorporated in the same chart will benefit the users to switch back and forth between the time frame to see how the current days price moment reflects in daily and weekly and monthly chart and how indicator changes. Please think about considering it. 3.Please also consider about charts for BSE stocks. 4. Could you please also introduce 1 min , 2 min,3 min time frame in F &O options charts. 5. Could you please plan for scanners based on custom indicators for intraday and EOD, weekly and Monthly. It would be really great if you could do.Because many popular sites lack this option. You know what will happen to your market share if you provide it. I understand we should not expect more when it is provided for free. But These are my suggestions that you could try considering it so that it would be even more better. Once again. Thank you very much for providing it for free. May God Bless you with all the happiness. Soon will add more backfill data. Initially planning for CNX500 stocks. Maintain your patience will happen in a short span of time. For getting EOD, Weekly and monthly charts it is recommended to visit our Interactive Charts -- EOD section. Currently we dont have any plans in shorter term to display 1min data. current base interval is 5min and getting 1min data directly from the exchange is 5-6 times costlier for us. May be in the long run we will think about adding it. No plans to add BSE stocks. Problem is poor volumes and higher pricing for us. 4. Could you please also introduce 1 min , 2 min,3 min time frame in F&O options charts. As explained it gonna cost us 5-6 times higher than our current budget. so no shorter term plans. We are in the process of making realtime scanners. Will take some time to get something better. 6. Why dont you also consider about providing top gainers, losers,volume shockers list etc so that marketcalls will be a only one portal where we can get everything. Like one stop shop. It is already under our plan. Already we had made a heatmap for Nifty 50 cash and futures. Soon it will extend to other bare minimum analytics as well. Hi , Thank you for your prompt reply. I appreciate that. I just want to bring it to your attention on the issue/point noted on charting. In 5 min chart, time stamp is mentioned with the ending time of the candle, say for the first candle of the day is mentioned as 9.20 where as in 1 hr chart the first candle of the day is mentioned as 9.15. If the timestamp is mentioned as ending/starting time in lower time frame and the same principle has to be followed in larger time frame as well. Candle formation is perfectly fine. just in 5min it look like it is calculating on closing basis and rest all the intervals it is calculating right from the open. logically it is meaningful to show in such a way. Another reason -- why your website is at the top my favorites list. I would like to know will there be any time delay ? This is a very good move..
Do you have plan to incorporate backtesting/ Walkforward and Optimization. Whatever we done is just integration with little programming skills. But we are coming up with something more meaningful for traders. 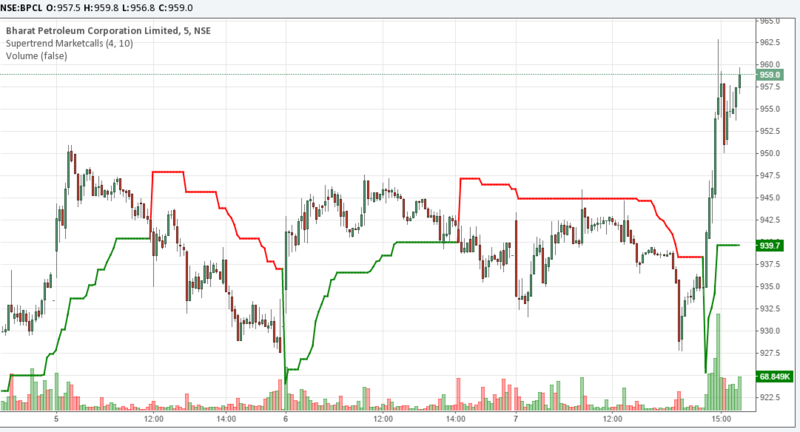 Thanks a lot for providing 5min interactive chart. it is best real time online interactive chart I have ever seen. If possible, please add 2,3 min chart. I am ready to pay for that. If possible add commodity chart. I’m planning to add SMA, EMA high-low option in tradingview could take some time. All these are already available at tradingview.com. You have just used their charting library and posted as if you have created all these features. You know what, Tradingview doesnt provides NSE Cash, Futures intraday charts but just EOD charts do checkout from your side. intraday cash charts are not loading..
Do you have plan to MCX reat time Iterective charts..like NSE Cash Realtime Charts ?